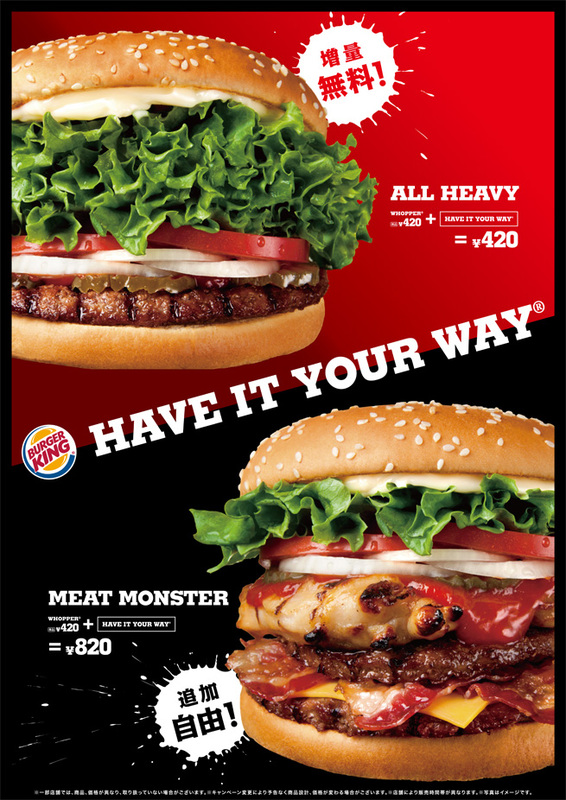 Last week Tokyo Five briefly mentioned the new promotional Burger King sandwiches, which are available now exclusively in Japan (lucky us): the All Heavy Whopper and the Meat Monster Whopper. I don't think these are getting as much coverage in the blogosphere as McDonalds' Big America burgers (probably because there aren't a whole lot of Burger King locations in Japan). They've had some interesting offerings in the past, though. Man, looking at these things I'm kinda glad there are no franchises in Kansai. If there were I might be tempted to try one out. While these beastly burgers don't do most of us any good, I noticed a few interesting and useful kanji in the above advertisement that I thought I'd point out. Yay - real kanji in everyday life action! It's funny because they really are offering you free weight gain, though I assume in this case they're referring to the weight of the extra toppings. 無料 is an absolutely pivotal word to know and recognize. You definitely want to understand when you're being offered something for free! Next let's look at the Meat Monster's splatter. It reads 「追加自由！」. This lesson is brought to you by Burger King, apparently. Trying to eat healthier these days but I'd almost definitely go get a Whopper for lunch if there were a BK around. Learned some new Kanji today thanks to Burger King (and Blue Shoe)! What a way to learn kanji! Yay new kanji! Thanks for the comments, Rene and Lina. I find that textbooks only go so far for me - seeing kanji in some kind of real life context makes them a lot easier to remember. This is awesome! One of the best parts about actually being in Japan is getting little lessons like this in unexpected places. Hurray for immersion! Thanks Alice! Agree 100%! Man, my Japanese is gonna plummet when I leave. I don't get 追加自由...does that mean you can pile as much meat on it as you want? If so, the name "meat monster" is perfect! lol. Kaori - good question. I'm not sure, actually. Maybe just because it's another type of Whopper, so it's an additional choice. T5 - Sure thing. Me too - love seeing that kanji. Just Another Week in Japan: 1st Edition!